Count down to Christmas with the Unibet Advent Calendar. Between the 1st and 24th of December 2013, Unibet has a new, amazing daily promotion! Check the Christmas Calendar from Unibet daily to see what is on offer. You don't want to miss out on risk-free bets, free spins, bonuses and so much more at UNIBET ! Thank you, Marina, it sounds great, hope I can remember it, many casinos have the "Advent" Promotion ( just like last year ) rolling and it's hard to keep an eye on every one But, I'll do my best! I love Advent Calendars! Love surprises. Ahh very very nice, just clicked on Window 1 in the Christmas Calendar from Unibet and today there are 10 free spins on Gonzo's Quest. Today it's 3 December 2013, Unibet offering today a blackjack promotion. Wager at least €20 on the Blackjack table and get a random no deposit bonus on 4 December. The free bonus is between €5 or €30. You need to Click on “Opt-in” at Unibet if to take part in the Blackjack promotion. You can do this by clicking on the Advent Calendar and then number 3. You need to Place 5 bets of €5 on your favourite sport events, and Unibet gives you a €5 extra cash treat. Today 5 December 2013 at Unibet win a €100 cash in the live casino! Play today your favourite Roulette games with charming live dealers and maybe you are one of the lucky winners that win a €100 Free Chip. Unibet giving away random 20 x €100 cash. Win free Unibet Open Poker Tickets! Here are the Prizes what you could win! Place a bet of at least €10 in the Unibet Live Casino and you will have a chance to win €100 extra! 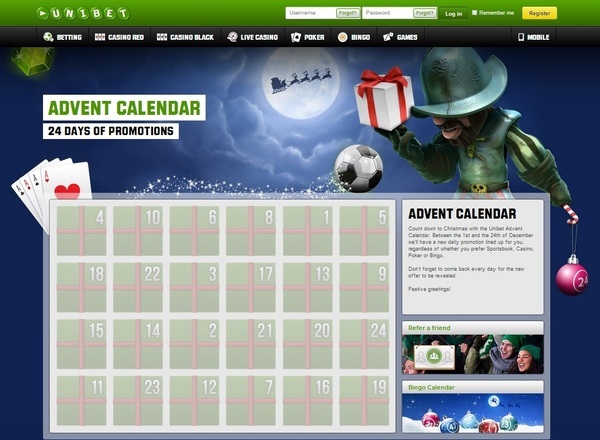 The Unibet Christmas Calendar offers a really nice promotion for today. You could earn yourself up to 50 Free Spins on Starburst. Wager €25 on Starburst today to get 10 Free Spins tomorrow. Wager €50 on Starburst today to get 25 Free Spins tomorrow. Wager €100 on Starburst today to get 50 Free Spins tomorrow. Important you need to opt in for this via the the Unibet Christmas Calendar. The nice thing on this promo is, here does not count how much you deposit. The wagering counts! So even if you make a little deposit of €5 or €10 and you manage to wager €25 or more on Starburst, you will get Free Spins! How about €10 SUPERTOTO cash back from Unibet today. For their Christmas calendar, make a bet of €20 on one coupon, or spread the €20 across different coupons and you'll receive the €10 cash back no matter the outcome of your wages. and tomorrow you will get 10 Free rounds on the South Park Video Slot. So if you are a casino player, that likes a pokergame you could win some free cash! Are you still new to Unibet ? Get a 200% match bonus on your first deposit + 20 Free Games! For more information see Unibet Promotions. Wow now it is getting really exciting at Unibet! Today one player stands the chance on winning a 10,000 cash prize! If you reach the highest win from a single spin at Unibet and this amount is lower than €10,000, they will top this up to €10,000. Start your Monday with a BURST!!! Log in today at Unibet and you'll receive 5 freespins on Starburst video slot. But that's not all. If you make a deposit on Monday, you'll receive 15 freespins on Starburst tomorrow. Make sure you opt in if you're making a deposit for those extra freespins. Very nice deposit bonus at Unibet for the 17th. Opt in and receive a 25% deposit bonus of up to €50. What a great time to be playing Secret Santa video slot!! Love these Advent Calendar's. You never know the next surprise. On December 18th, players can receive up to 150 FREE spins on Dallas NetEnt video slot. Unibet is going Mobile for the 19th of December 2013. Log in today on your Mobile device and you can receive 10 free spins to play Mega Fortune Touch. If you play at least €10 on any of their Mobile Slots, you'll receive your free spins tomorrow.